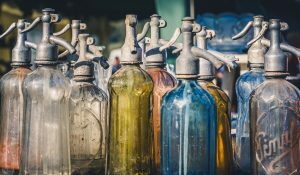 What’s the Difference Between Vide-Greniers, Brocantes, Braderies and Marché aux Puces? Drive anywhere in France during the summer and you’re pretty much guaranteed to see posters advertising a local brocante. 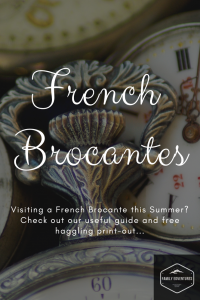 But, what are brocantes? The word brocantes comes from the French verb “brocanter” which means “to deal in second-hand goods”. They’re not your usual carboot sale or second-hand stall though…there’s much more charm to them than that. You can often spot Brocantes by looking out for the handmade signs outside of villages and towns. But, the French take these things very seriously and as a result there are a few handy websites that share the Brocantes that are organised for each region (listed below). 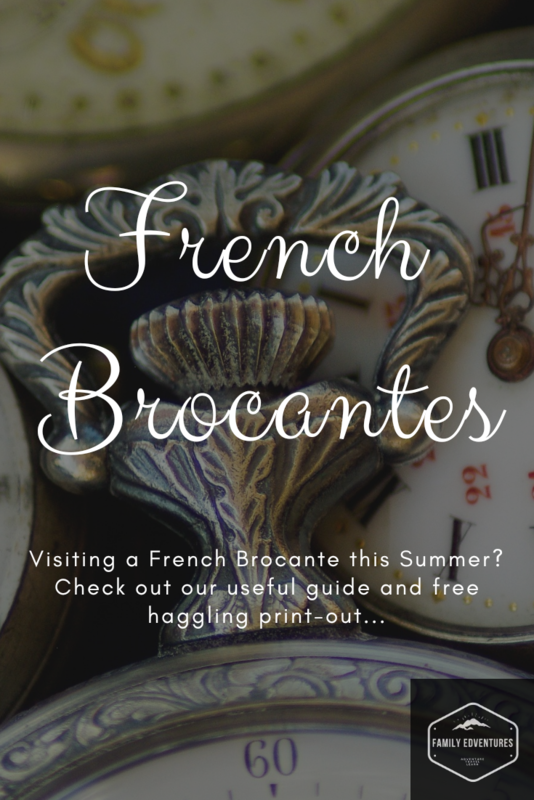 We’ve also put together a free printable ‘How to Haggle in French’ page to help you when you arrive at your chosen Brocantes! The French hate waste and they place a real value on buying and selling second-hand items. There are loads of places you can go to buy used items in France so we’ll take a look at each one…where you can find them and what you can expect to find there. 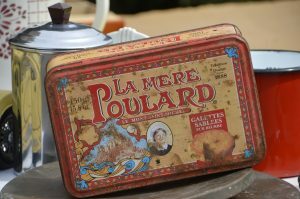 If you visit France in the summer months you will probably hear mention of vide-greniers, braderies and marché aux puces. 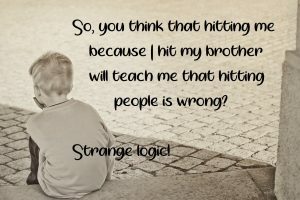 Some people assume that they all mean the same thing…but they don’t! So, what ‘s the difference? French for “emptying the attic”. These are similar to car-boot sales or yard sales. It’s basically when individuals want to clear out some items for their homes and make some cash in the process. You’ll find toys, clothes, books alongside other unwanted possessions. You may even spot some cheap larger items of furniture. Sellers are keen to get rid of items so you can expect to grab some bargains. Chambord in The Loire Valley which has over 500 stalls in the grounds of the chateuax. It starts at 4am so you’d better set an alarm clock if you want to see everything it has to offer. Anency in Haute-Savoir is a beautiful setting for a brocante with 200 stalls lining the streets of the old town. This stunning lakeside town is extremely popular with tourists so it can get very busy. You’ll find braderies in Northern France, one of the most famous being in Lille. They’re annual street markets that can be found in the Netherlands, Luxembourg and Belgium, aswell as Northern France. Shopkeepers sell their items outside their shops at reduced prices in the summer. Their big events and these shop stalls are often joined by food stalls, les puces, artisans and music. Set up like a traditional French market but without the food. The stall holders at these regular markets are often dealers. 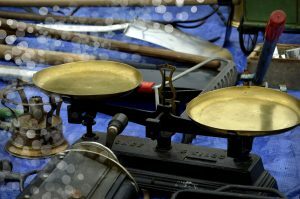 These “Flea Markets” are more like an Antiques Fair where items are carefully presented and prices are generally higher. You’ll find restored furniture from the 1900’s, art-deco pieces and beautiful paintings. You may still find some bargains but these professional “Antiquaires” sellers will hold out for higher prices. Brocantes have to be one of the best things about summer-time in France! The treasure hunting, the atmosphere, the people. 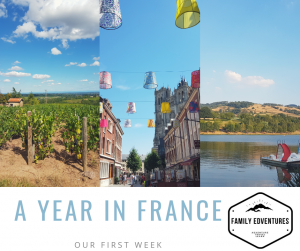 For the last few years we’ve helped our French family out at one of their charity bracantes in a small town called Tramayes in the beautiful Burgundy countryside. It’s a real community affair. For days before the vans go out collecting unwanted furniture that wouldn’t look out-of-place on the pages of a glossy magazine…despite being stored in a chicken shed for the last few years! There’s excitement in the air as if the village is preparing for a friend’s wedding. Furniture is stacked in an old open barn and the smaller pieces are laid out on make-shift tables. On the day of the Brocante, the treasure hunters show up early…there’s lots to see. The locals chat and laugh as they sort through boxes of keepsakes, silverware, kitchen paraphernalia and beautiful lace. The sun beams down on the visitors as they peruse the aisles of tables, weighed heavily with the villages offerings. The colourful vintage glassware reflects its hues on the whitewashed outbuilding that’s bursting with books that are also for sale. At midday, visitors slow to a trickle for an hour or two. It’s lunchtime and this is France after all! The tablecloth is laid and the baguette is sliced as cooked meats and sausisson is passed around the Brocante volunteer committee. There’s wine of course and cheese…before the selling begins again. Almost every village in France holds Brocantes for a few days each Summer. There are many bargains to be had. You can find massive wooden cart wheels, beautifully crafted wicker baskets and detailed fabric wall hangings…all at bargain prices. Make sure you arrive early though or the dealers will beat you to it and they’ll add a few zeros to the price before displaying it neatly in their shop! As with all second-hand buying, it’s worth haggling especially if your buying a few things. To get the best results be form but polite and don’t sound too eager. 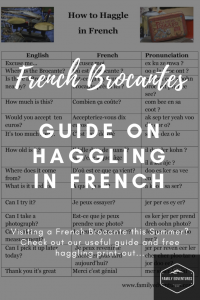 Keep reading to find my ‘How to Haggle in French’ free printable! 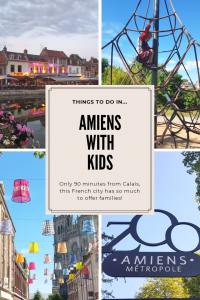 As with all treasure hunts…a map is handy so take a look at these websites to help you plan your French adventure. Click the region you intend to visit and a list of brocantes will be displayed. It will also tell you if there are marché puces, vide-greniers or braderies arranged too. Measurements. If you’re looking for a piece of furniture to fill a particular space then measure it before you leave home. Jot down any measurements and the items you’re looking for and take these with you to the brocantes.This way you won’t be stuck deciding between wasting money on an item that might not fit or missing out on something you like. Tape measure. Don’t forget to pack a tape measure so that you can measure any furniture that interests you at the brocante. Food and drink. Don’t count on there being a food stall. Some of the smaller brocantes won’t sell refreshments and with shops closing midday for a few hours, it’s a good idea to go prepared! Trailer. 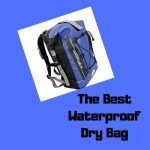 This entirely depends on what you’re hoping to buy and how far you’re travelling. If you’re hoping to kit out your new French farmhouse then it’s a good idea to bring a trailer along if you have one. You may also get a better price if your buying a few things and taking them away straight away. Cash. Sounds obvious but make sure you take enough Euros. Vendors may not be willing to hold items while you find a bank. Be very careful carrying large sums of money, especially in larger markets. Most car insurance polices only cover small amounts of cash left in a vehicle. It would be advisable to try giving the 90’s look and purchasing a bum bag/fanny pack! Remember to print out my handy haggling in French sheet…keep scrolling! Paper and pen. If you’re struggling understand a price then ask the vendor to write it down! Problem solved! French vocabulary list. Remember to print out my handy haggling in French sheet…keep scrolling! 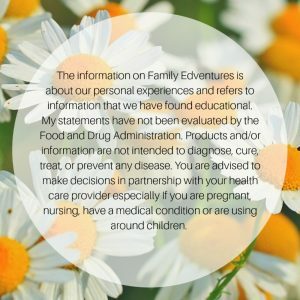 Speaking a new language can be a little nerve-wracking initially so I’ve put together (with the help of my linguist husband!) a handy printable for you to take along with you. I managed quite well for a long while with gestures and pointing but it always helps to have a few specifics up your sleeve! Especially if your after a deal at a Brocante. 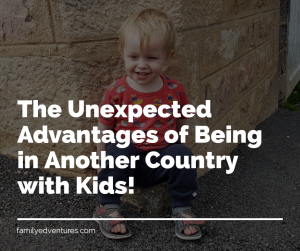 You may like to check out my guide on learning a new language as a family too! Excuse me… Excusez moi ex ku ze mwa ? Where is the Brocante? Où est la brocante ? oo e la broc ont ? Is there a Brocante nearby? Est-ce qu’il y a une brocante près d’ici ? es kee l eeh a oohn broc ont pre dee see? How much is this? Combien ça coûte? com bee en sa coot ? Would you accept ten euros? Accepteriez-vous dix euros? ak sep ter yeah voo diz oor o? How old is it? Il/elle date de quand? or Il/elle a quel âge ? il dat der kohn ? il a kel aje ? Where does it come from? D’où est ce que ça vient? doo es ker sa vee en ? What is it used for? A quoi ça sert? a koo a sa ser? Can I try it? Je peux essayer? jer per es ey er? Can I take a photograph? Est-ce que je peux prendre une photo? es ker jer per prend dreh oohn photo? Can I take a measurement? Je peux le/la mesurer? Jer per ler mer oo rer ? Can I pick it up later today? 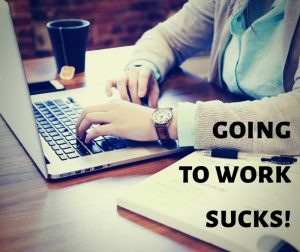 Je peux revenir le chercher plus tard aujourd’hui? jer per reven eer ler cher cher ploo tar o jor doo ee? Ha! I’m not a great haggler either! To be honest…if it’s a good price then I’ll just pay it! Everyone wins that way ? All the best treasure hunts are unplanned! What a unique activity, I go to Paris pretty frequently so I’ll have to go on a brocante hunt on my next visit. 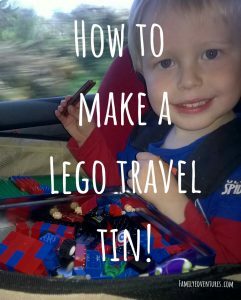 Just bring a spare suitcase for your finds! This brought back memories of going to Dinard with my mum a few years ago. Every house seemed to have a table outside with things to sell. I bought a lot of toys for my children and then had to translate the instructions. Great fun. Haha! We seem to have acquired more toys!!! No idea how we’ll fit them in the car!